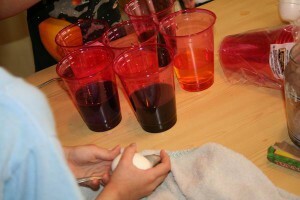 This was after the eggs had been soaking in the dye an HOUR. I don’t actually like dyeing eggs. Every year I say I’m not going to do it. But then, about two days before Easter, I just can’t help myself. I keep thinking it’s going to be great. Maybe next year, I’ll just do it myself with no children. Yes, I think that’s a good plan. This morning, I hardboiled a bunch of eggs, realized I didn’t have any dye like I thought, so we went to Reasor’s, came home, and got started. I remembered my own advice and actually put my toddler in his high-chair this time, so that part went much better. 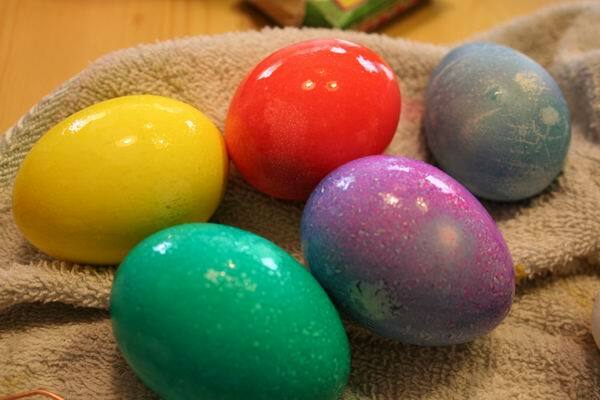 And I’ll admit, that PAAS Easter Egg dye takes forever to dye the eggs. It’s not very bright. And it’s hard to make a neat design. I got that. So, I got out some glitter glue to let her paint a design on. No good. More sobbing and gnashing of teeth. 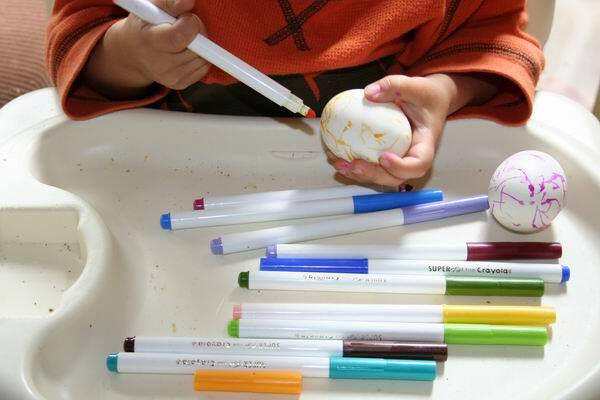 My eight-year-old son was actually doing fine, happily working away at his end of the table, and my two-year-old son was happily coloring on his eggs with marker, until he saw the paintbrush, then he wanted to do that too. 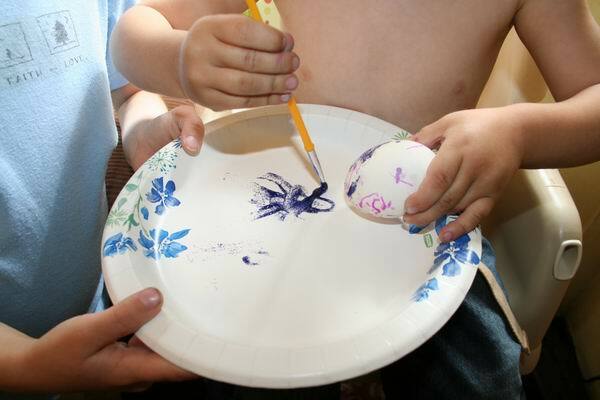 Then he happily painted his egg, and his stomach. The issue today was my daughter was so very sad about life. Looking back now, I think she’s exhausted. She’s been staying up too late and rarely takes a nap anymore, but she still sort of needs one. A good two-hour nap would probably help a lot. And working on not whining. Anyway, we (I) decided we’d just leave the eggs soaking in their dye, and the kids could go to eat pizza with their grandparents, and we’d finish tonight. We’ll see how the eggs look after six hours in dye. Maybe I’ll clean everything up while they’re gone and pray they forget about it. But that’s unlikely. How in the world do you dye eggs at your house? Is there a dye that works better? Do you put two dye tablets in a cup to make the colors brighter? Do you use paint or markers, or skip the whole thing all together? Tell me, what do you do? This entry was posted in Homeschooling and tagged Crafts, life with little ones by Charity Hawkins. Bookmark the permalink. Like you I used to feel OBLIGATED to dye Easter eggs. And if I didn’t plan on doing it with my children a grandmother would step in and volunteer to dye eggs with the kids. Somehow, all the grandmas forgot this year. Whew. My biggest gripe about dyed eggs is the eggs themselves. What to do with them? I don’t eat them. The kids don’t eat them. My family uses them to make deviled eggs. I don’t like deviled eggs. So what’s a mom to do? Luckily, my children are old enough to be reasonable. At least my daughter is. She realizes that wasting the eggs is… well, wasteful. My son is easily distracted and easily bribed with sugar or electronics. (Oooooh. Did I just say that?) So… NO EGGS. Maybe in a few years you will get there too. How about plastic eggs and stickers?? ?